The host of Animal Planet’s Monsters Inside Me explores the world of parasites and their human hosts. Evolutionary biologist Riskin paints a disgusting yet highly entertaining and informative canvas illustrating how living things use behaviors that are often gross and frightening to survive and thrive. The author is a passionate observer of bats, and his career studying them in their various habitats around the world has given him distinct impressions of Mother Nature. Rather than the gentle, incomplete and utopian vision presented by marketers and the media, the author argues for a different perspective. While not dismissing the gifts provided by the natural world, humans should also understand the other side of our natural environment. “I think the disgusting, immoral, and violent side of nature, the side that the grocery stores and shampoo commercials leave out, contains its most awe-inspiring and beautiful parts,” writes the author. Devoting a chapter to each of the seven deadly sins— greed, lust, sloth, gluttony, envy, wrath and pride—Riskin takes readers through remarkable scientific territory. Discussing sloth, the author tears down preconceptions surrounding the idea of nature being a “perfect model of hard work,” sharing stories of parasites who mooch off their hosts, including vampire bats that eat nothing but blood; worms that can grow to four inches long in the human body and cause elephantiasis. In the chapter on wrath, Riskin explodes the myth of nature as a peaceable kingdom. The author’s narrative examining killer whales’ instincts, especially those in captivity, jolts the senses. He explains the difference between venom and poison while discussing poisonous snakes, and woven throughout the narrative are queries surrounding the “roots of fatherly love,” arising from the birth of his son and the role of nature in this relationship. 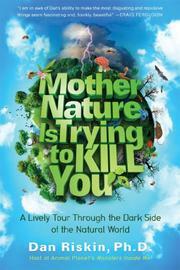 A fact-filled and amusing trek through nature’s dark side that adroitly combines learning and the yuck factor.